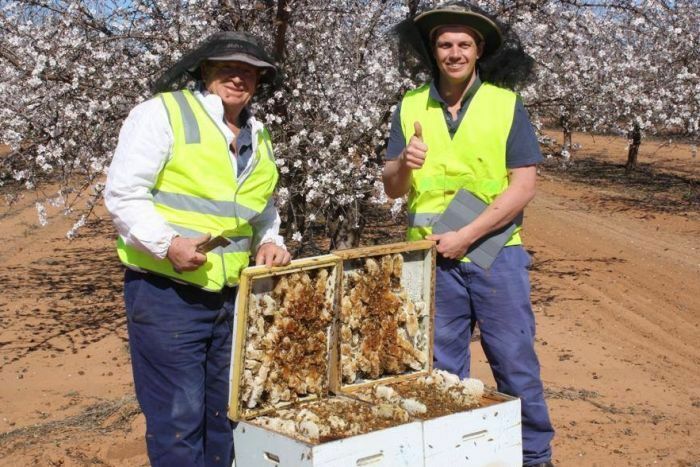 The pollinator in one of Australia’s key food bowls claims he can no longer base his 2,000 hive operation in the region because of chemical use by the emerging cotton industry. Harold Saxvik’s family has been keeping bees at Darlington Point in the New South Wales Riverina for more than 80 years. In 2013, he lost 500 hives to insecticide spray drift which he believes came from nearby cotton farms. Since then he has been moving his bees to avoid any risk but he said it had become unworkable. “To go out and see all your hives or your bees dead on the ground is really devastating,” he said. This year Mr Saxvik contracted 15,000 beehives from around Australia for the booming almond industry, which is expected to triple production in the next few years. According to the Almond Board of Australia, the crop earned $1 billion in 2015. Prices have fallen since then but the nut was still Australia’s third largest horticulture export. Mr Saxvik’s company helps pollinate more than a dozen other crops in the Riverina, including crucial vegetable seed for growers around Australia. “We produced tens of millions of dollars worth of seed … 80 per cent of our production of bees was for seed pollination and now it’s come to the stage where we’re going to have to move all our plant and all our hives,” he said. Cotton is thriving in the Southern Rivers region with a $250 million harvest expected from the Murrumbidgee, Murray and Lachlan Rivers this season. Ironically it is the development of a genetically modified cotton variety which uses far less insecticide that has led to the growth of the industry in a region previously considered too temperate for the crop. Bolgard cotton needs to be sprayed as few as three times a growing season compared to up to 20 times for conventional cotton. Cotton Australia’s chief executive officer Adam Kay said the industry had made huge reductions in chemical use and was recognised internationally for its environmental stewardship. “It’s a fantastic story,” Mr Kay said. “For the last 15 years we’ve been able to, through concerted research and development effort, reduce the amount of pesticide that the industry uses by over 90 per cent. He said the industry contributed to about $60 million a year in research into new softer chemicals that were safe for bees and other beneficial insects. “Look it’s certainly right through everything we do in our pesticide guides and our best practise management program,” Mr Kay said. The president of the New South Wales Apiarist’s Association, Neil Bingley, said the cotton industry needed to do more. “The cotton industry thinks that we’re a small industry but when you take the pollination of all the other horticultural crops, we’re a major player and Cotton Australia does not have the right to drive us out,” Mr Bingley said. He believes some cotton growers along the Murrumbidgee are still spraying up to nine times a season. “Our biggest concern is the Fipronil. It doesn’t take much of that spray at all, a light drift will kill thousands of hives,” Mr Bingley said. Fipronil and a class of pesticides known as neonicotinoids have been restricted by the European Union because of their potential harm to pollinators, but the science is controversial and the EU’s Food Safety Authority is currently reviewing these restrictions. The Australian Pesticides and Veterinary Medicines Authority said the chemicals were all safe to use as recommended by their manufacturers. Crop Life Australia, which represents the plant science industry, said the EU restrictions had done nothing but harm farmers. Crop Life Australia CEO Matthew Cossey said Australia had one of the world’s healthiest bee colonies despite the use of these insecticides. “We’ve seen in Europe, where neonics got blamed for a range of things, banning them took about 600 million pounds Sterling out of production, it didn’t have an impact,” Mr Cossey said. “There’s multiple threats to bees and to other pollinators, but bees specifically and they are varroa mite, the small hive beetle, over work, a whole range of issues. Watch Sean Murphy’s report on Landline this Sunday at noon. This entry was posted in Fauna Impacts, Spray Drift on February 18, 2017 by Anthony.